St. Patrick’s Day always makes me long for Ireland. I love Ireland. I have had the extreme fortune of visiting the country twice and each visit was absolutely wonderful. If you ever have a chance to go there, take it. The country is gorgeous and the people are some of the nice and most friendly people you could meet. My first trip to Ireland was in the fall of 2008. It’s hard to believe it was so long ago! We were on a tour that basically traveled around the entire coastal area of the country and even went up into Northern Ireland. We saw many of the major places one would like to visit while in Ireland: The Cliffs of Moher, Giant’s Causeway, Derry, Belfast, Dublin, etc. 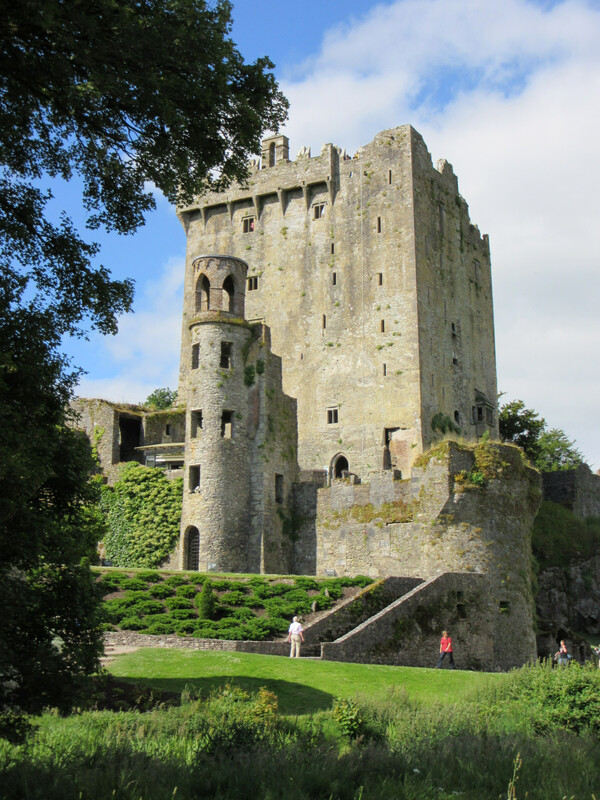 We visited Blarney but did not actually go to the castle on that trip (we fortunately got a second chance on our visit this summer). I wrote some of my fondest memories into a sort of prose poem you can read here. One of the things that amazed me most about that trip was our tour guide’s knowledge of his country’s history, and his ability to share the stories with us. Every day on that trip he told us the history of the country and the places we visited; we probably covered well over a thousand years of history on that trip, and never once was it boring. It wasn’t like listening to a history teach lecturing us, it was fascinating. Maybe because I was interested to begin with, but I prefer to think it was our guide’s storytelling ability. One of my most vivid memories from that trip was one night in Dublin, after we had dinner we were returning to our hotel on the bus. This night our guide indulged our requests for song. He sang the song “Four Green Fields” which if you’ve never heard it, you can listen here. The story in the song represents the struggle between Ireland and England, and a desire for Ireland to be a single whole country again. I wish I had recorded my tour guide singing that night. The entire bus was silent, and you could just hear the emotion in his voice as he sang. It was beautiful. This summer I was able to go back to Ireland. This time we only spent a few days in the country before traveling on to the United Kingdom, but it was just as wonderful as I remember. When that plane landed at the Shannon airport I felt like I was coming home. I’m not sure I’ve ever felt quite as calm and happy as I do when I’m in Ireland; there’s just something about the country that makes me feel like I belong there. While we returned to some places we had seen on our first visit (Blarney Woolen Mills, Bunratty Castle) we also got to see some incredible new sights along the Ring of Kerry, including some time spent in the ruins of an Iran Age Ring Fort (you can see some of my photos from the trip here). The peacefulness and quiet of the country has struck me every time – six years had passed since my last visit, but it still felt the same. The world didn’t feel as rushed or hectic while we were there. Ireland is a wonderful place for a relaxing vacation. I know I am lucky to have had the opportunity to visit the country twice, but I already can’t wait for a third visit. Ireland is truly one of my favorite places in the entire world. I also love a lot of things that come out of Ireland. Several years ago I wrote a blog post about some of the things I loved about Ireland. Most of them are still true. Though since that time I have discovered the works of Tana French, an excellent Irish author. If you enjoy mysteries I highly recommend you give her books a try. The Irish and the British have a completely different concept of drama than we do here in the United States. They understand that you don’t need action and explosions to have a truly compelling mystery; I found this often true in my favorite British television shows, and it is really evident in French’s writing. Aidan Turner is still high on my list of favorite Irish actors (especially since The Hobbit, and he’s now starring in the British drama, Poldark) but I can now also add Eoin Macken (Merlin, The Night Shift) to that list as well as Jamie Dornan. But you don’t have to watch 50 Shades of Grey to see Dornan in action (in fact, please don’t). If you don’t want to torture yourself by reliving his fate on Once Upon a Time, you can check out The Fall on Netflix. The Fall also stars Gillian Anderson as a detective trying to track down Dornan’s serial killer. The series is very well done and definitely much more worth your time than 50 Shades. 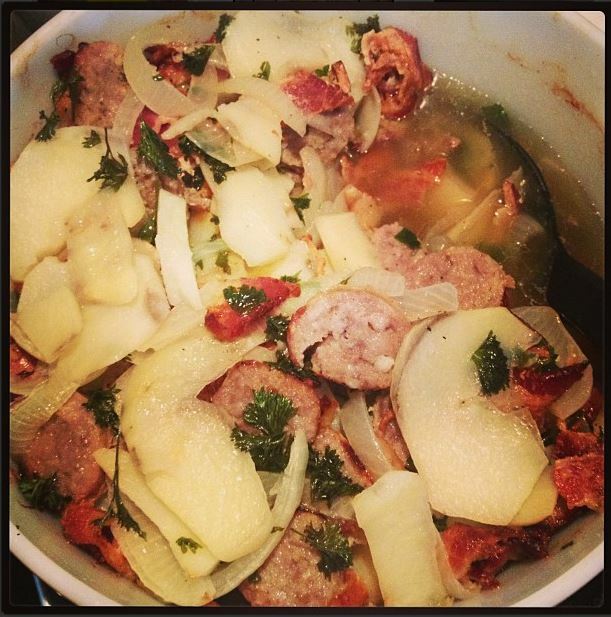 In honor of St. Patrick’s Day my family will be making an Irish Coddle (or often called Dublin Coddle). It’s a delicious mixture of sausage, potato, bacon and onion. It’s not even remotely healthy, but it certainly tastes good. If anyone is interested in trying their own, I’ll include her recipe below. It must be eaten with Irish Soda bread, which isn’t too hard to find in grocery stores this time of year. Another part of our tradition is watching either Darby O’Gill and the Little People or The Quiet Man – both classics. Darby O’Gill is a movie I’ve loved since I was a child, though the banshee in the end always terrified me. The Quiet Man is a John Wayne film set in Ireland and we visited the village where it was filmed during our first trip to Ireland. If you or your family have any St. Patrick’s Day traditions feel free to share below! In a skillet cook the bacon pieces and drain on a paper towel. Prick the sausage with fork, then brown in the bacon fat. Drain sausage on paper towl and slice into 1/4 in pieces. Peel and slice potatoes about 1/4 in thick. In casserole dish, alternate layers of bacon and sausage, onion and potato, seasoning potatoes with salt & pepper. Sprinkle each layer with a little parsley. Pour off all but 2 tblsp. of fat from the skillet. Add water and bring to boil, then poir over the casserole. Cover and bake at 350 degrees for 45 min. Remove cover and cook an additional 15 min. until top is browned and potatoes become tender.